This is a letter from Miss Berry to Mrs. Hamill thanking her for her check of five dollars. Miss Berry expresses that they have almost one thousand students at Berry and with the recent drought the students need more clothes and to be furnished more than ever. 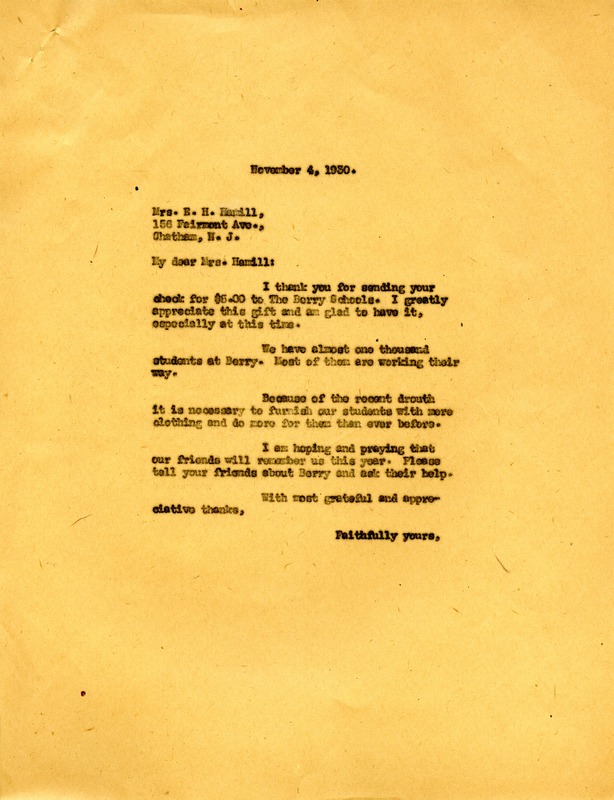 Miss Martha Berry, “Letter from Miss Berry to Mrs. Hamill.” Martha Berry Digital Archive. Eds. Schlitz, Stephanie A., Kelsey Wetherhold, et al. Mount Berry: Berry College, 2013. accessed April 20, 2019, https://mbda.berry.edu/items/show/12739.